Beautiful Fort Lauderdale boasts an ideal location on the southeast coast of Florida, right between Palm Beach and Miami. A hip smaller city, “The Fort” is a quirky combination of upscale yachting center, cosmopolitan urban area and laid-back beach town. With a thriving arts community, impressive restaurants, world-class entertainment and top-notch health facilities, this sunny city is pretty nearly the perfect southern spot for snowbirds. Flying: Snowbirds from Canada can enjoy easy access to this lively slice of Florida sunshine courtesy of the gorgeously revamped Fort Lauderdale-Hollywood International Airport (FLL). Other nearby airport options include Miami International Airport (MIA), just a half hour’s drive to the south and Palm Beach International Airport (PBI), 45 minutes to the north. There are daily non-stop flights all year round with morning arrivals and departures from Toronto and Montreal. With three major airports in the Fort Lauderdale area, you’ll want to do some price comparison shopping to find the best deals on airline tickets. Driving: If you want to drive your own car down to Fort Lauderdale, the drive from Toronto, Montreal and Ottawa is about 22 – 24 hours. If you plan on driving to Fort Lauderdale from other Canadian cities, it will take you about 32 hours from Winnipeg, 43 hours from Calgary and 49 hours from Vancouver. While some snowbirds prefer to drive to Fort Lauderdale as fast as possible, we suggest making the most of your drive down by taking the time to stop and explore some unique spots and attractions along the way. Canadian snowbirds will feel right at home in this lively little city particularly as there is there is a thriving Fort Lauderdale Canadian snowbird community. You’ll have plenty of company from back home - the area is a favorite with Canadians looking to escape the cold, ice and wintry winds up north. You can enjoy a culture, language, society and standard of living much the same as you’re accustomed to in Canada while enjoying weather and beaches as glorious as those on a Caribbean island. With its warm, delightful tropical climate, this popular Canadian snowbird destination enjoys more than 3000 hours of sunshine every year and an annual average temperature of 25C. While your neighbors back home are shoveling out of a wintry mess, you’ll be enjoying highs in the low 80s in October and November, while January through March temps top out in the high 70s and April brings in the toasty 80s. Blue skies, warm ocean waters and balmy breezes are staples during this season, as the majority of the rain and humidity occurs during summer. When you think of Florida, do you immediately visualize miles of white sandy beaches fringed with swaying palms? 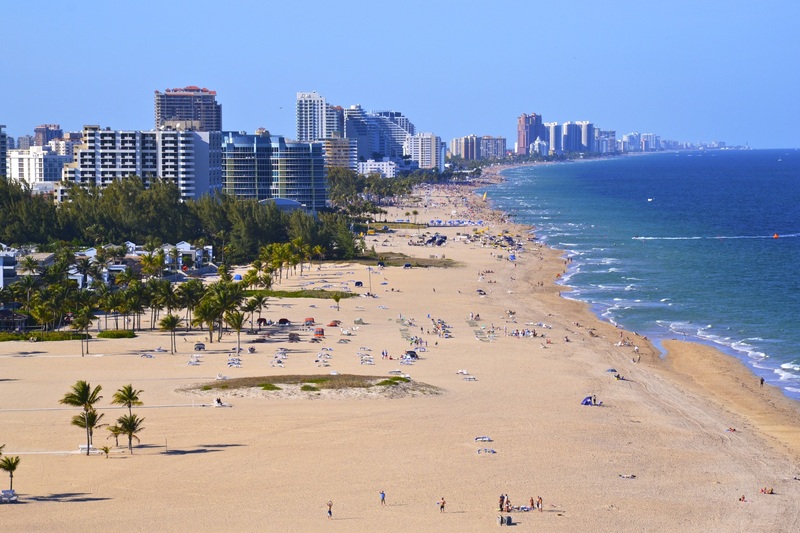 With over 23 heavenly miles of golden sandy beaches overlooking the gin-clear waters of the Atlantic, Fort Lauderdale invites you to forget all about the snow and ice back home and head out to endless water sport activities or just plain lazing in the sun with a good book and a cool beverage. This favorite snowbird destination boasts a grand 165 waterways from an intricate system of canals to beautiful rivers and the warm waters of the Atlantic, offering boundless opportunities for diving, snorkeling, swimming, fishing and boating. Fort Lauderdale is generally a safe city. However, as in any urban area, you should be alert to which neighborhoods you enter, particularly during the late night hours. As the most common crime is automobile theft, protect your vehicle by avoiding remote areas and parking in areas with busy pedestrian activity. With 33 square miles and a population of about 190,000, the City of Fort Lauderdale is big enough to offer plenty of shops, restaurants, museums and entertainment while still retaining a friendly small city vibe. From the fine galleries and theaters of the Riverwalk Arts and Entertainment District to the scenic streets of Old Fort Lauderdale, there’s plenty of art, culture and shopping to fill a typical sunny snowbird day. Green spaces abound, with one of the favorites being the Arts Park at Young Circle, a 10-acre urban public space with a huge playground for the grandchildren, a grand concert amphitheater and educational workshop spaces. One of the great things about retirement is having the time to pursue new interests or learn more about your current passions, and Fort Lauderdale is bursting with opportunities to do just that. The Lifelong Learning Institute at Nova Southeastern University (NSU) provides opportunities to audit classes at the university, along with an extensive slate of educational lectures, field trips and special events. In addition, many communities partner up with university outreach programs for lectures and trips associated with everything from history and science to photography and writing. There's a wealth of culture and entertainment options in this hip little southern Florida city. If you're looking for spectacular live entertainment, enjoy a night out at the world-famous Broward Center for the Performing Arts, hosting Broadway musicals, ballets, plays and operas at its stunning waterfront complex. Museums include the historic Stranahan House Museum, the Museum of Art and the Museum of Discovery and Science. Shoppers, rejoice! The city’s Las Olas Boulevard is known as the Rodeo Drive of Florida, and you’ll find lots of international flavor in Port Everglades, the second-largest cruise port in the world. From casinos and horse racing to art festivals and classical jazz events, there’s never a dull moment in this popular snowbird destination. Fort Lauderdale has become somewhat of a foodie destination these days, particularly the two delicious miles of restaurant-laden Las Olas Boulevard. From surf-and-turf al fresco options to ethnic eateries, you’ll find incredible variety in both Fort Lauderdale and Hollywood, including a growing number of options from big-name celebrity chefs! Winter in Fort Lauderdale comes along with a brimming slate of exciting events and festivals. Get dazzled with yachts and parties during October’s Fort Lauderdale International Boat Show, and then later in the fall channel your inner film fanatic at the two-week Fort Lauderdale International Film Festival, offering over two weeks of screenings, seminars and parties. Get your holidays started at the dazzling Seminole Hard Rock Winterfest Boat Parade, with weeks of lively pre-events leading up to Florida’s largest single-day spectator event of themed, decorated yachts, lights and music. Being a Florida snowbird is all about getting outside and enjoying the balmy tropical weather, whether on the golf course, aboard a jet ski or on the tennis courts. With more than 40 golf courses catering to players of all levels, the city is a favorite of fans of this premier retirement pastime. Just minutes from downtown, there’s a wealth of opportunities to get out and enjoy the gorgeous natural environment. Kayak through picturesque canals at the Anne Kolb Nature Center or head to John U Lloyd Beach State Park for fishing, canoeing or sea turtle spotting. Residents of this little piece of tropical paradise are generally pretty health-conscious, and you’ll find plenty of opportunities to roller blade, cycle, jog or join a local beach yoga class. Whether you’re into golf, a SCUBA diving enthusiast or an avid sailor, the Fort Lauderdale snowbird community has a club, excursion or activity for you. Don your diving gear and explore sunken ships, colorful coral reefs and incredible marine life. Known as the “Venice of America” for its abundance of waterways, the city is a renowned yachting center with over 100 boatyards and marinas where more than 40,000 resident yachts provide floating homes to thousands of blissful Florida snowbirds. Snowbird Meetups provide an outlet for meeting like-minded folks interested in any kind of activity, while Singles Over 50 Meetups are an ideal place to share some fun in the sun and meet new friends. While no-one likes to think about health care and medical emergencies while travelling, it’s comforting to know that there are plenty of top-notch health care facilities throughout the area just in case you need them, including Fort Lauderdale’s Holy Cross Hospital. If you like to relax on an organized cruise or excursion, the Greater Fort Lauderdale abounds in exciting expeditions. Take a snorkeling or scuba diving trip out to the area’s extensive natural coral reefs, sit back and enjoy a sunset cruise or take an intimate gondola ride through the city's picturesque canals. If you’re not scared of alligators, step aboard an airboat everglades tour or just roam the fascinating acres of Butterfly World or Flamingo Gardens. If you want to head a bit further afield, the city is a major cruise port, and it’s easy to book an affordable 5, 7 or 10 day Caribbean cruise from Fort Lauderdale on well known cruise lines like Royal Caribbean, Princess Cruises, Carnival, Holland American and others. With its astonishing array of Fort Lauderdale snowbird accommodation options, the city can cater to every lifestyle. The Sunny Isles Beach and Hallandale Beach areas are among the favorites of Canadian snowbirds, so you’ll feel right at home within easy reach of the beach. Accommodation Rentals: Rent a gorgeous waterfront home, choose a spacious apartment, find a condo in a lively snowbird community or join the fun in RV parks. If you’re not ready to make the major choice of purchasing a second home, Fort Lauderdale vacation rentals give you a variety of vacation amenities and lifestyle choices without the need to make a big financial decision. When looking for snowbird vacation rentals, it's best to get started early to find the best and most affordable accommodations. The south coast of Florida is a popular and somewhat pricey part of the state, but good deals can be found with some research. Renting is a great way to become familiar with an area with little relative cost or risk. After a few seasons of renting in Fort Lauderdale, you'll have a good idea of what neighborhood you'd like to buy in. Buying Ford Lauderdale Real Estate: If you’re interested in buying a Florida vacation property, Fort Lauderdale real estate is booming, so you may want to consider making a long term investment in a community that will provide years of fun in the sun. Right now home prices are still fairly low in Fort Lauderdale, meaning you can snap up a bargain with some careful shopping. Visit various neighborhoods, ask the locals and consult as many realtors as you like to get a good picture of where you’d want to live. Some Canadian snowbirds prefer to stay in a snowbird vacation rental for a season or two before they buy a piece of Fort Lauderdale real estate. While living in Fort Lauderdale can be expensive, there are also options for more budget conscious snowbirds as well. The cost of living in Fort Lauderdale is lower than in many Florida cities, including Miami, just 50 miles away, which means that you can find find better deals on snowbird vacation rentals in this smaller destination.